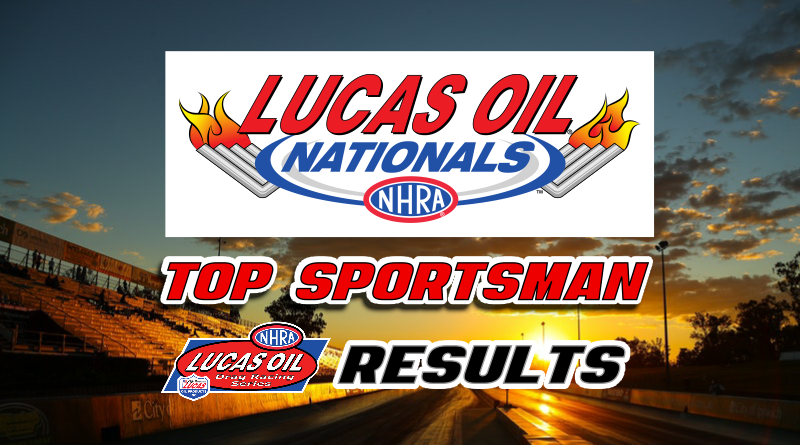 BRAINERD, Minn. – NHRA Lucas Oil Nationals Top Sportsman winner JR Lobner claimed his fourth win of the year, three Lucas Oil Drag Racing Series wins and one national event win, to move into the top spot in the national championship points chase. Lobner, of Gardner, Kan., defeated Michael Freischel by .001 in the final round. Lobner, driving his ’96 Cutlass, has been on fire since the middle of June winning every event he has attended excluding a first round loss at the Topeka LODRS race #2. In making the Lucas Oil Nationals final, Lobner made it back-to-back wins as he won the LODRS at Brainerd the week prior. Needless to say, the last two months have been outstanding for Lobner. In Brainerd, Lobner enjoyed a .016 reaction time average which lead him to the final round. Along with his great reactions, Lobner’s car was typically dialed in around .01 faster than he could actually run. Having one of the slower cars in the class, Lobner cannot afford to hold much on the dial as the six second runners in the class close the gap quickly at the finish line. Lobner began eliminations with an easy win over longtime Division 4 racer Allen Firestone when his ’16 Camaro fell off the pace early in the run. Lobner was ready with his .009 R.T. and eventually eased to a .093 over 7.573 for the win. Lobner’s second round opponent, Dan Schei, left before the tree was activated giving Lobner a free pass into the third round. The third round produced a repeat of the previous week’s LODRS final round when Lobner paired against Division 4 racer Royce Freeman of Elite Motorsports. Lobner used a .009 to .046 starting line advantage to push Freeman under the index and claim the win. Lobner pedaled once to go 7.527 on his 7.51 dial while Freeman killed 10 mph but still ran under by -.028. Freeman dialed up for this round but his car ran inline with previous runs. I’m not sure if he miss judged the track and/or the weather, or was trying a different strategy against Lobner. In the semifinal round, Lobner took a close .005 win over Jeff Southerland. Lobner once again drilled the tree with a fine .010 reaction but was followed closely by Southerland’s .015. Lobner pedaled at the top end, he scrubbed .03 of E.T., to go .019 above the dial in taking .005 stripe. Southerland was also .019 above his dial in the losing effort. The win moved Lobner into his fourth national event final round. On the other side of the ladder, Michael Freischel, of Cottage Grove, Minn., raced to his third national event final driving his ’01 Pontiac. Freischel was setup much like Lobner in eliminations as he was typically dialed about .01 quicker than his Pontiac could actually run. Freischel began eliminations with a first round matchup with national title contender and two-time national event champion Don O’Neal. Freischel took the .029 to .047 reaction time advantage and held on for the win as he posted a .039 over 7.559 to take the .008 win over O’Neal. O’Neal was set up about .05 quick on the run and dropped hard at the top end to go .029 above in the losing effort. I’m not sure if O’Neal misjudged the finish line or if he intentionally gave up the stripe but he did drop about .08 and 15 mph on the run. Freischel defeated second round opponent, Scott Schleicher, after Schleicher’s car ran .129 over the dial in a losing effort. Freischel won his third round encounter with Monte Weaver after pairing an .005 light with a .019 over 7.569 to easily defeat Weaver’s .027 light and .033 over 6.543. The win earned Freischel a bye run in the semi’s sending him to his third national event final round. The final round was a great race as Lobner took the win by .001. For the first time in eliminations, Lobner did not earn the reaction time advantage. His respectable .021 trailed the stellar .010 laid down by Freischel. At the top end, Frieschel’s Pontiac couldn’t run the number which allowed Lobner to back into him taking a .001 stripe and the win. Freischel’s all out .031 over 7.581 came up just short as Lobner scrubbed .03 at the finish line to go 7.559 on his 7.54 dial. Lobner drove an exceptional race in earning his 3rd national event Wally. Congratulations go out to Lobner on his win and on taking over the points lead for the national championship.